Horse are incredibly sensitive creatures, they rely on their instincts for their overall safety. If they sense an uncomfortable situation their "fight or flight" mentality comes into play. 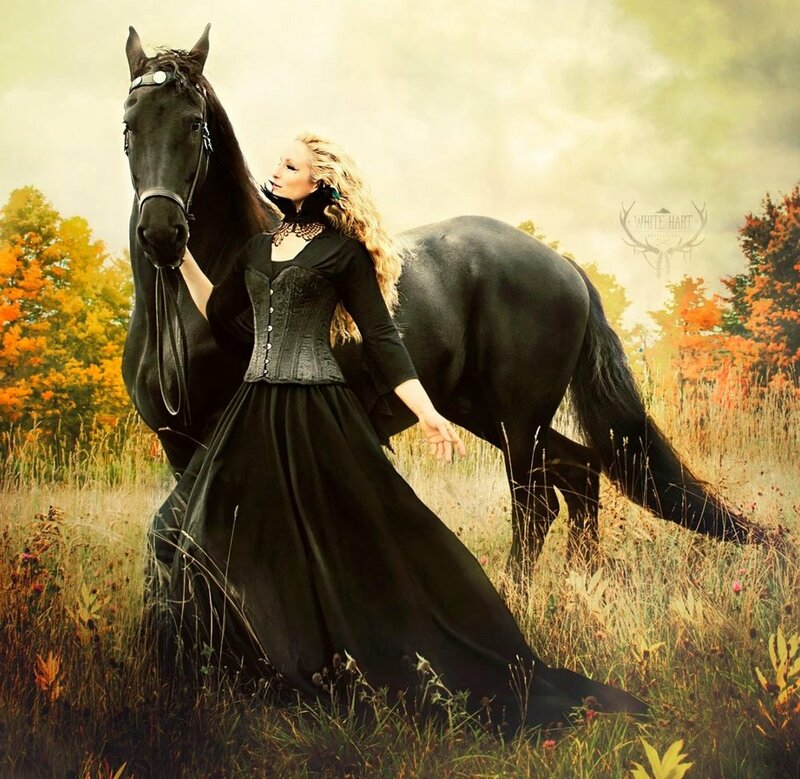 Horses will teach you the incredible power of your emotions and how to harness your personal energy. If you arrive at the barn in a negative mood, frustrated or tired, the horse will sense that as weakness and feel uneasy. If you approach their stall in a great mood, confident, and looking forward to your ride then they will be more interested in their work. Put yourself in your horse's shoes...if your owner/rider was tense and frustrated you wouldn't be that excited to go trot and canter circles over and over again would you? It took me many years for this to really sink in. I spent so many rides in frustration at my inability to improve. I am a type-A, goal oriented person and learning to train a horse doesn't exactly go according to plan. I broke down in tears more times than I care to remember. I tried too hard and let myself think negatively about my skills. This blocked my ability to relax and really feel my horse. Timing comes when the rider can truly be "in the moment" with their horse. You must focus and read the horse's body language to react quickly and correctly. If you are constantly thinking negative thoughts such as, "I am never going to get this." "The other riders look good, why can't I do it?" "This is too hard, why won't my horse just do it!" "He always spooks in that corner." "I always get tight in the flying changes." What you think about materializes into reality so be careful! If you constantly repeat any negative thoughts they will continue to be a problem in your riding. You must learn to take a negative thought and turn it into a positive one. For example: "I am never going to get this!" can turn into "This is hard but I am going to master it!" You are recognizing the difficulty but encouraging yourself to push on and believe that you can do it. We can only accomplish what we truly believe is possible. Surround you and your horse in an imaginary bubble. Imagine that you and your horse are enclosed in a quiet, safe place. Almost like an invisible force field that protects you from outside, negative energy. I try to feel that my aura is merging with my horse's aura, creating a highly positive force field. Close your eyes. Don't allow your eyes to wander towards the on-lookers or the other riders if they intimidate you or make you feel inferior. That will only make you self-concious and your ride bad, the opposite result that you actually want! Try closing your eyes for a few strides, feel the horse moving with you, or focus on the horse's ears, notice if his attention is on you. The better you can filter out the unnecessary thoughts and distractions, the more sensitive you will be to the finer details of riding your horse. Ride a pattern. Pick a dressage test that you and your horse are familiar with and ride through it. This gives you something to focus on and relays confidence to your horse because you are certain where you are going. Often times riders wander around the arena aimlessly and never really know if their horse is truly on the aids. Have NO Expectations. I have found over the years that I ride better when I have NO expectations of how my ride will go. I am not focusing on a specific test for scores for an upcoming show...I am simply riding my horse, working on weaknesses and enjoying our strengths. Horses do not have an agenda and they certainly do not always agree with the rider every day. Try to be aware of how your horse is feeling and tailor your ride accordingly. Take your time in warm-up. Rushing your warm-up is a key to disaster! Your warm-up should be based on rhythm and relaxation. I always start with a free walk on a long rein to allow the horse and myself to warm up together. I like to feel my hips open, my legs relax and then feel the back of the horse swinging with a relaxed topline. Make sure your basics are intact, the energy is good, the swing through the back is there, and your horse is supple before you attempt the harder movements. Smile! The simple act of smiling can also change your attitude. If you are becoming negative and over-focusing on a problem I suggest taking a walk break (very important for the horse as well if he is frustrated). Try to find something in your mind, in another horse/rider, or in your surroundings that you think is positive. Recognize it and smile, appreciate the positive and then pick up your reins and go back to your ride. This is also a great opportunity to breathe deeply and release tension in your back and shoulders. I hope these suggestions help you Begin the Dance with your horse. If you have any other tips to help riders develop a positive attitude please leave a comment below! Or you can email me with any comments or questions at beginthedance@gmail.com.